In great fear of Esau, Jacob divided his people into two groups and then he selected gifts for his brother. Jacob spends the night wrestling with God. After 20 years of working for his uncle Laban, God commanded Jacob to return to the Promised Land. Jacob hastily packed up all of his goods and left for home without informing Laban of his departure. In spite of a three day head start, Laban caught up with Jacob but was restrained by the LORD from bringing him back by either threat or enticement. After Jacob and Laban made a covenant and shared an evening meal, the next morning Laban returned home. Jacob also went on his way and was met by God’s angels. So Jacob named that place Mahanaim which means two armies or camps in Hebrew – signifying his own company and the heavenly host that had encamped in that location. When Jacob had left his father and mother to travel to Laban’s house 20 years before, the LORD had promise that He would be with Jacob, would watch over him and would bring back to his homeland. The angels of God appeared to Jacob, to encourage him with the assurance of God’s promised protection. Jacob wanted Esau to know that he had amassed some wealth while he was away living with their uncle Laban. Being self-sufficient, Jacob wanted his brother to know that he had no need to ask for anything from him. Twenty years before, Jacob had deceived his father Isaac by pretending to be Esau. After Jacob stole Esau’s blessing, Esau was enraged and had said to himself, “The days of mourning for my father are near; then I will kill my brother Jacob.” For twenty years Jacob lived with the memory of how he cheated his brother. For twenty years he wondered whether Esau still planned to kill him. For twenty years he had dreamed of going home, but each time his dream becomes a nightmare when he thinks of Esau. Now Jacob, having learned that Esau was coming with four hundred men to meet him, was in dire fear that Esau was planning to attack and kill him. Jacob divided his family and animals into two groups in an attempt to save one group if the other was attacked. Although Jacob had purchased the birthright from Esau and was entitled to a double-portion of his father’s inheritance, when Jacob fled from home to escape from his brother Esau, all he had were the clothes on his back and his staff in his hand. Now Jacob was returning to his homeland with great wealth and many children. The LORD indeed had been with Jacob and had been gracious to him. First of all, Jacob had been obedient and returned to his country and relatives as the LORD had commanded. Considering that Jacob feared for his own life and the safety of his family, I am sure that Jacob prayed fervently to the LORD. Jacob prayed with humility stating that he was unworthy of God’s kindness and faithfulness towards him. Jacob prayed from a thankful heart for the blessings that God had bestowed upon him. Jacob prayed in faith believing that the LORD was capable of saving him. Finally, Jacob’s prayer incorporated the very words of God and the promises the LORD made to Jacob. Jacob’s approach to prayer is a good model for any believer to emulate. First of all, we must be obedient to God’s commands. If not, then we must first repent and ask His forgiveness. We should pray fervently, in humility, with thanksgiving, and in faith believing that God is capable and faithful to perform His Word. According to mathematicians, two numbers are amicable or friendly if each of them is equal to the sum of the divisors of the other number. 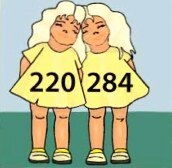 The first pair of Friendly Numbers is 220 and 284. The divisors of 220 namely 1, 2, 4, 5, 10, 11, 20, 22, 44, 55 and 110 add up to 284. The divisors of 284 namely 1, 2, 4, 71 and 142 add up to 220. The first gift selected for Esau was a total of 220 goats, while the second gift selected for Esau was a total of 220 sheep. These two gifts were comprised of amicable or friendly numbers of animals. The third gift selected for Esau was comprised of: 30 camels + 30 calves, 50 head of cattle and 30 donkeys which totaled 140 animals. This quantity is the smaller half of what mathematician call a “semi-friendly” pair of numbers. Two numbers are semi-amicable if each of them is equal to the sum of the divisors of the other number. But unlike friendly numbers, the number 1 is not included in the sum of their divisors. The divisors of 195 (not including 1) are 3, 5, 13, 15, 39, and 65 add up to 140. 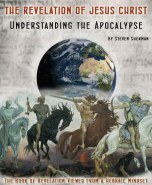 The third gift for Esau was comprised of a semi-friendly number of animals. A triangular number or triangle number counts the objects that can form an equilateral triangle. The triangle number 10 is familiar to those who bowl: the ten bowling pins are arranged in a triangle. The triangle number 15 is familiar to those who shoot pool: at the break, the fifteen pool balls are arranged in a triangle. A triangle is a 3-in-1 geometric shape. Each side is co-equal in length and connects to the two other sides. 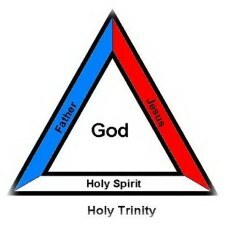 With its 3 sides and 1 figure it represents the triune nature of God. Not only did Jacob send Esau three groups of animals before him, the numbers of animals that comprised each herd were friendly and semi-friendly numbers that can be expressed as the sum of 3 triangular numbers. When the angels of God met Jacob on his way, they may have instructed Jacob on how many animals he should offer to his brother Esau. Jacob was hoping to quench the fire of Esau’s anger by sending s three waves of expensive gifts before him so that his brother would receive him without hostility. The Jabbok is a stream that is a tributary of the Jordan River. It intersects the mountain range of Gilead and falls into the Jordan on the east about midway between the Sea of Galilee and the Dead Sea. Jacob sent his family, his servants and his possessions across the Jabbok but he stayed on the other side. Wrestling is one of the most physically demanding activities that there is. Wrestling is personal, physically exhausting, and emotionally taxing. Although Jacob was 97 years old, he wrestled through the night. Even when he suffered excruciating pain from having his hip dislocated, he refused to let go of his opponent. With the coming of daylight, Jacob and this mysterious man might be seen by others. Since this significant encounter was to be highly personal, the man said that it was time for Jacob to let go. Jacob understood that the man he wrestled with was no ordinary man. The hip is the body’s largest ball-and-socket joint. Surrounding the hip joint are many tough ligaments that prevent the dislocation of the joint. The strong muscles of the hip region also help to hold the hip joint together and prevent dislocation. This man just touched the socket of Jacob’s hip and it was wrenched out of place. This man was not only supernaturally powerful but Jacob understood that the man also had the spiritual authority to bless him. Names of people in the Bible have great importance. A person’s name may reflect their character or have prophetic significance, while others reflect their faith and gratitude to God. Many years later, Manoah the father of Sampson asked the same question. Both Jacob and Sampson’s parents had an encounter with the “Angel of the LORD.” Though Jacob wrestled with a figure that looked like a man, Jacob declared that he saw God face-to-face. Jacob saw the second person of the Godhead – the pre-incarnate Jesus. Yeshua is the Word of God made flesh. Believers, who are willing to wrestle with the written “Word of God” – the Bible – even if it takes all night, will receive a blessing of revelation and understanding. The problem with the notion that Israelites do not eat the tendon attached to the hip is that there are no tendons attached to the hip socket. Although the hip contains ligaments (the fibrous tissues that connects bones to other bones), there are no tendons (the connective tissues which attaches muscle to bone). However, to clear up the matter, according to the rabbis this passage is actually prohibiting the consumption of the sciatic nerve which is contained in the muscles of the thigh and must be removed for the meat to be kosher. But this passage is much more than about dietary laws. It is about relationship with God. Jacob’s walk was changed. He could no longer run away from troubling circumstances. Jacob could no longer walk ahead of the LORD as he did when he listened to his mother and deceived his father. Jacob’s name, character and walk were changed forever. Yes indeed, he was blessed.